Abed Rabbeh clings to his ancestral land. His sons, who live in Dheisheh 'camp' will stand sentinel against land robbery when he goes. 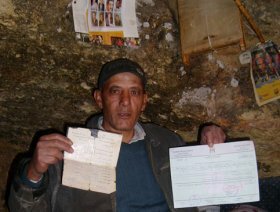 Abed Rabbeh in his cave holding his father's ID and court documents proving the land belongs to his family. "The Israeli police used a bullhorn and shouted 'death to Arabs!' toward me once," Abed Rabbeh remembers, his hands wrapped around a small ceramic cup of tea. "Another time, they tried to tell me that my grandfather was born in Dheisheh refugee camp and that I have no roots in this land." His face breaks into a wide smile. "However, I have documents that prove that my father, my grandfather and many generations before him, were born here, in al-Walaja village. Now, I'm the only one left here." Rabbeh, a man in his late forties, is one of the last holdouts of al-Walaja's indigenous Palestinian population. Ethnically cleansed beginning in October 1948 by Israeli forces, most of al-Walaja village now remains a smattering of stone house ruins, destroyed wells and picnic areas frequented by ultra-orthodox settlers. The rest of al-Walaja's uprooted population and their descendants mostly live in Dheisheh today. Across the road -- and a checkpoint -- is the Jerusalem Biblical Zoo, and nearby is the area of the destroyed Palestinian village of al-Malha, which today is the site of an enormous soccer stadium and an equally sizable shopping mall. The sprawling, constantly expanding city of Jerusalem continues beyond the horizon. For the past 15 years, Rabbeh has lived by himself on a gently-sloping hillside in al-Walaja that he has thickened with green vegetation and abundant, hand-planted crops of all kinds of edible produce. A well-built chicken coop is at the top of his land, and calm doves mingle with a dozen constantly clucking hens and a few white rabbits. Without permission to build a modern house here -- a common restriction by Israeli policies and military orders making Palestinian village growth in the so-called "seam zone" (dozens of Palestinian enclaves in between the Israel's inside the West Bank and the internationally-recognized green line boundary) illegal -- Rabbeh has set himself up inside a Canaanite-era cave. Small, but warm inside, the cave is lined with bookshelves and decorated with photographs and newspaper clippings of articles mentioning his struggle and the struggle of Palestinians in general. A wood-burning stove sits in one corner across from a small bed and table with wooden chairs, and a tin roof extends outwards to protect the cave from the elements. Outside there is a makeshift campground-style kitchen and patio with farming supplies, tools and buckets to catch rainwater. This corner of al-Walaja is the only remaining part of the village not fully taken and supplanted by Israeli settlements that ring the Jerusalem-Bethlehem area. Here, the expanding colonies of Gilo and Har Gilo sandwich Rabbeh's land and settlers have their sights on this tumbling hillside. Plans are on the table to attempt to connect the illegal Jerusalem-area colonies of Gilo to the massive Gush Etzion bloc, which stretches south of Bethlehem, with a new settlement they want to call Givat Yael that would take the rest of al-Walaja -- and Abed Rabbeh's ancestral land. Israeli government planners, along with a private settlement development corporation also called Givat Yael, say they want to house at least 45,000 Jewish Israelis on this land. "The Israelis say this is part of Jerusalem," Rabbeh explains. "But this is technically the occupied West Bank. So I came 15 years ago to live here and prevent them from taking the rest of my land." His wife and children live in Dheisheh refugee camp, where he was born, just a ten-minute drive east inside Bethlehem. But he says that every time he stays with his family in the camp, which is seldom, he dreams fervently about al-Walaja. "I love being here. I love this land and the food I grow here. I plant something new every day. I can't live without this place." In the years following the June 1967 War and Israel's military occupation, settlement colonies in the occupied West Bank including East Jerusalem were established on confiscated Palestinian land. The Gilo settlement blocs were first developed in 1972, and currently house more than 40,000 Jewish Israeli settlers. Since the second Palestinian intifada in 2000, Israel's policies of land confiscation in this area have proliferated immensely. Hundreds of acres of what was left of al-Walaja's land were taken as the borders of settlement colonies -- and those of the Jerusalem municipality itself -- expanded. Today, villages in close proximity to Jerusalem, like al-Walaja, not only face settlement expansion, but regular house demolitions and annexation by the ongoing construction of Israel's illegal wall. Meanwhile, Jewish Israeli settlers and the Israeli police forces that protect them continue to intimidate and attack the last remaining residents of al-Walaja. "They used to come here and push me around. The police took me to the checkpoint and arrested me; they put me in jail for a few days. But I am not afraid of their attacks. The ones who should be afraid are the settlers. Because when I am gone, my sons will continue to stay here after me, and their sons. There are generations after me who will stay on this land." Last year, on a routine trip to Israel, US President Barack Obama was invited by Rabbeh to visit his cave and talk about his situation. Rabbeh explains that it is a microcosm of the current Palestinian struggle for basic human rights under a military apartheid regime. The US president expectedly refused; but a response letter was sent from the US Consulate in Jerusalem with a sympathetic, but brief, note of regret. When asked what he would have said to Obama, Rabbeh says he would have told the president that Palestinians "want a real peace; not only the peace that Israel wants. In the end," he would have explained, "we are all human. We want to live normally, how everyone else in the world lives. My family and I want to live here and build our future together." Abed Rabbeh turns to a loud squawking noise that interrupts our conversation inside the cave. Rushing outside, we see a red fox turn and quickly leave the area, unmatched by the raucous protest of the farm's unruffled resident rooster. Rabbeh coaxes the bird back to the coop, laughing proudly. "Every time settlers come," he says, "I stop them. A settler once offered me millions of dollars to move and give up my land. I refused. I won't abandon my history to live in Dheisheh, even though my family is there. I refuse to be a refugee."